Jean-Pierre Peugeot and Jean-Frédéric Peugeot established their eponymous French company in 1810. By 1842, they produced coffee, pepper, and salt grinders. The company’s entry into the vehicle market was via crinoline dresses (a stiffened or structured petticoat designed to hold out a woman’s skirt, popular at various times since the mid-19th century), which used steel rods, leading to umbrella frames, saw blades, chisels, wire wheels, and bicycles. Armand Peugeot introduced his “Le Grand Bi” penny-farthing in 1882; seven years later he built his first automobile. Armand Peugeot became interested in the automobile early on and, after meeting with Gottlieb Daimler and others, was convinced of its commercial viability. The first Peugeot automobile, a three-wheeled, steam-powered car designed by Léon Serpollet, was produced in 1889; only four examples were made. Steam power was heavy and bulky and required lengthy warm up times. In 1890, after meeting Daimler and Émile Levassor, steam was abandoned in favor of a four-wheeled car with a gas-fuelled internal combustion engine built by Panhard (established as a car manufacturing concern by René Panhard and Émile Levassor in 1887) under Daimler license. The car was more sophisticated than many of its contemporaries, with a three-point suspension and a sliding-gear transmission. Now under the umbrella of Groupe PSA, Peugeot produced 2,119,845 vehicles in 2017. Peugeot is known as a very reliable brand, with its 1950s and 1960s models are still running in Africa and Cuba in the 2010s, where Peugeot is called “the Lion.” In 2013 and 2014, Peugeot ranked the second lowest for average CO2 emissions among generalist brands in Europe; the Renault car maker group was ranked first. 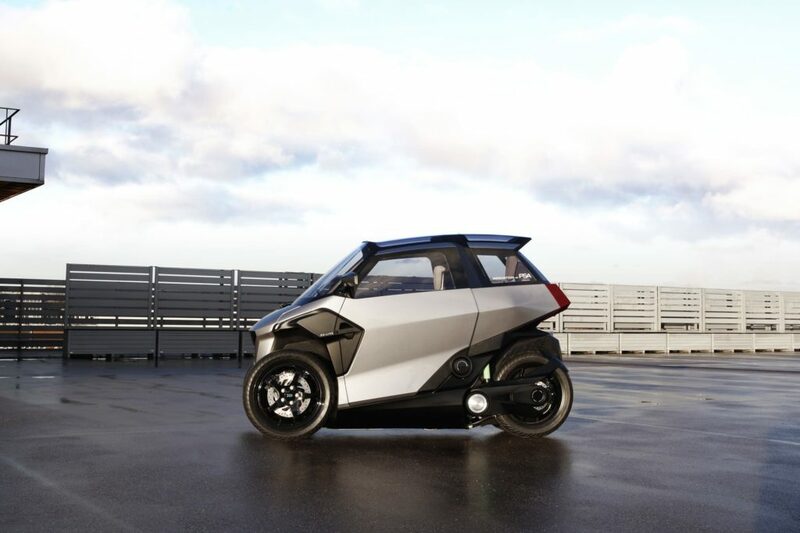 With all this momentum, Peugeot has invested its resources into future mobility solutions, based on a plug-in hybrid electric vehicle (PHEV) with tilting wheels and a tandem passenger design; let’s call it the e-Tilt. 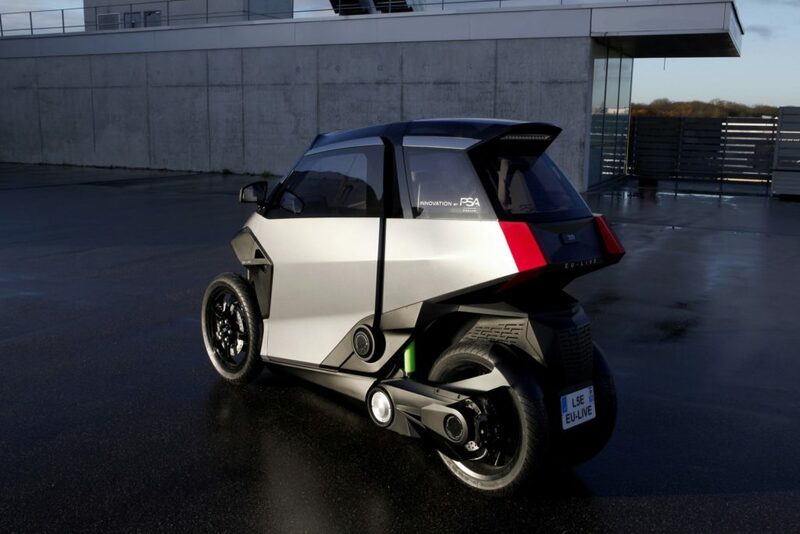 Based on architecture similar to a tricycle, Peugeot’s electrified light vehicle is adapted for urban and short trips with a zero-emission mode for city driving. 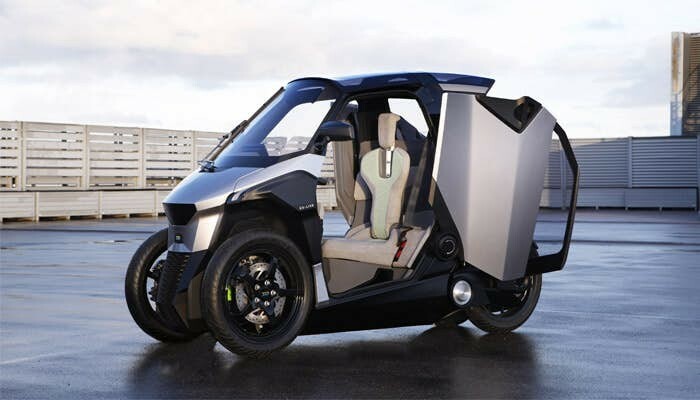 Funded with 6.7 million euros from the European Commission under the “Horizon 2020 GV5” Research and Innovation program, the e-Tilt is part of the “Efficient Urban LIght Vehicle” (EU-LIVE) European consortium, bringing together 12 partners from six countries, with Groupe PSA the only carmaker. 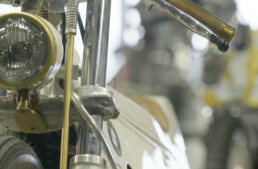 One of the EU-LIVE consortium’s main objectives is to develop common powertrains that can be used for a variety of L-category vehicles to achieve economies of scale. 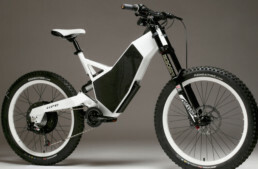 The e-Tilt runs in zero-emission mode at speeds up to 44 mph using two rear electric in-wheel motors, developed by Elaphe and Brembo.The 48-volt electric battery—designed by Samsung SDI—can be recharged using regenerative braking technology. When driving between 44 and 80 mph, the e-Tilt’s 31-KW single-cylinder gas engine takes over. The light vehicle has a total range of 186 miles and a top speed of 80 mph. 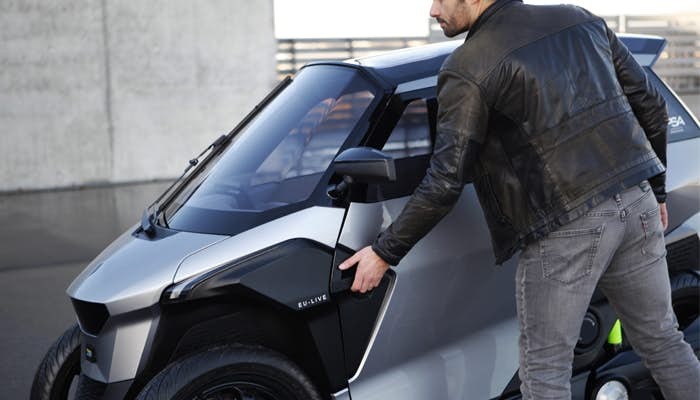 With a primary focus on city use, the vehicle’s small footprint (nearly eight foot long by a little more than two-and-a-half feet wide) and rotating doors free up road space and make for quick and easy parallel parking. The e-Tilt is enclosed, includes seatbelts and an airbag, and generates heat in the colder weather. Are tilting vehicles in our future? Yamaha just debuted its Niken, which Cycle World featured on the cover of its latest issue (which was celebrated at the Petersen Museum in Los Angeles among our Custom Revolution exhibit, with The Vintagent’s own Paul d’Orléans co-hosting). Do you think Peugeot is onto something tangible with its e-Tilt? Kudos for trying, we say. Are tiling vehicles of any kind … ICE or EV the future ? Well they certainly are a good idea as proven by the most sophisticated of all tilters … the Mercedes Benz ‘ Carver ‘ . Problem is many have tried yet all have failed to capture the publics imagination and wallet with both three wheels and four . So though I’m a fan … I’ll say an unequivocal … no … unfortunately .